RoTM There's a commonly-held belief that just about every animal on Earth tastes of chicken* - except, of course, those which taste like steak, or bacon. In the latter category, according to popular myth, are people - something only Uruguayan rugby players know for certain. 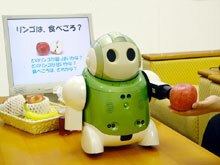 Until now, that is, because NEC earlier this year unveiled its Health and Food Advice Robot which was primarily designed to discern fine wines, but can also sniff out cheese and meats. It's all pretty straightforward tech: stick a bit of nosh in front of the robogourmet's infrared spectrometer and it analyses the reflected light to determine the chemical composition of the sample. A nice trick, although it can only be programmed to accurately identify a few dozen wines. Innocent enough, you may think. However, when NEC demonstrated the cybersommelier to a reporter and snapper from Associated Press, the robot claimed the former's hand tasted of prosciutto ham, while the latter apparently had the unmistakable whiff of bacon about him. *Including guinea pig and snake, we gather. Capybara, on the other hand, tastes a bit like steak, in case you were wondering.